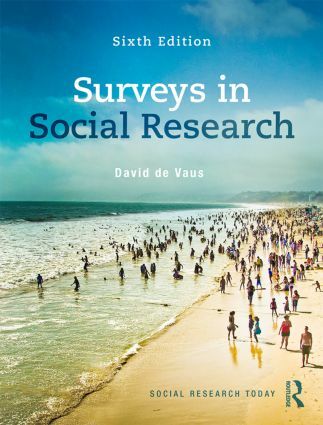 David de Vaus' classic text Surveys in Social Research provides clear advice on how to plan, conduct and analyse social surveys. It emphasises the links between theory and research, the logic and interpretation of statistics and the practices of social research. This sixth edition has been completely revised and updated, and contains new examples, data and extensive lists of web resources. As well as explaining how to conduct good surveys, de Vaus shows how to become a critical consumer of research. He argues that the logic of surveys and statistics is simply an extension of the logic we use in everyday life; analysis, however, requires creativity and imagination rather than the application of sterile mechanical procedures. The prime goal of research should be to gain accurate understanding and, as a researcher, use methods and techniques which enhance understanding. De Vaus advocates researchers use the method, rather than letting the method use you. Surveys in Social Research is essential reading for students and researchers working with surveys. It assumes no background in statistical analysis, and gives you the tools you need to come to grips with this often challenging field of work.